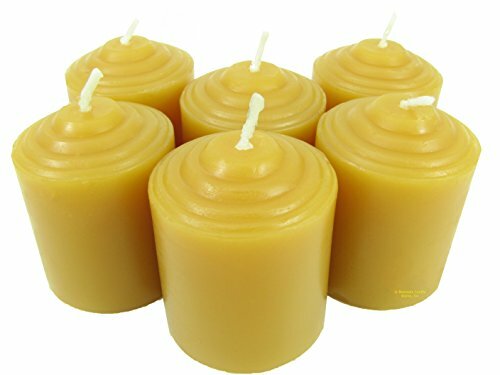 This is a pack of 6 pure 100% USA beeswax 10 Hour small votives. The burn time is approximately ten to eleven hours each. These straight sided votives are hand poured and are approximately 1.75 inches tall x 1.45 inches wide. There is approximately 1.4 ounces of beeswax in each votive. Do not burn free-standing! Burn in a glass candle holder that is similar in size with a continuous burn time of at least 4 hours to prevent tunneling. These votives are perfect for weddings, your favorite holiday and every day use. We use only 100% pure USA beeswax. We never use imported beeswax or other types of wax in our candle shop. Burn out of the reach of children and pets. Never leave a burning candle unattended. If you have any questions about this product by Beeswax Candle Works, Inc, contact us by completing and submitting the form below. If you are looking for a specif part number, please include it with your message.